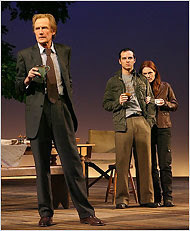 Bill Nighy's stage prowess and idiosyncrasies run rings around Julianne Moore in David Hare's new timely, politically-driven drama. Unfortunately, even Bill's magnetic performance is unable to stay the inevitable boredom that seeps in from watching all politics with few and far theatrics in between. David Hare is no fool. His ability to chew on foreign policies and the ramifications of capitalism is impressive. The fact that he can package his political awareness in a two-hour drama is admirable, but the feat isn't flawless in The Vertical Hour. In it, Hare foregoes entertainment for intellect with near snooze-inducing consequences. Julianne Moore is insecure in the role of Nadia Blye, an ex-foreign correspondent who's not quite ready to retire her ideals as a Yale Professor. She finds love with Philip (a watchable Andrew Scott), a british physical therapist with a quiet anguish tied to his n'er do well, ex-physician father, Oliver (Bill Nighy). Philosophies clash when Philip takes his girlfriend to the Welsh border to meet him. Bill Nighy outshines all when he enters the stage. Most popular for inhabiting the role of Davy Jones in Pirates of the Caribbean: Dean Man's Chest, he bears no facade when portraying the estranged father, living in solitude. He is comfortable in his lovable mannerisms as he challenges Moore in speech and in presence. He shreds through his technique whereas Moore, who is usually sensational, forgets hers. But the credit should also go to Hare for writing such a wonderful role. The best idioms and desire for debate belong to Oliver. He may irritate you with his need to know the specifics about everything, but he is a great, unique character. In terms of structure, the monologues for each actor are awkward, and they all flail in the pursuit of substance. Seemingly a window into their intentions, I was left trying to spit-shine their meanings. Scott Pask's set design is lush and realistic, complete with a warm, sprawling tree. He makes clever use of the spacious stage, which allows for impeccable scene changes. The pace of the narrative vacillates, often lulling with Moore's distracting inability to connect with the characters or the audience. With witty and informed dialogue, The Vertical Hour is a nice stroll down government lane. The British perspective of US-Iraq relations delivered by a quirky character is especially interesting. If only Hare had created a drama that was less like C-Span, and more like the Daily Show with Jon Stewart. Still, for political enthusiasts, this is a good one. Written by David Hare. Directed by Sam Mendes. Set Design by Scott Pask.